Binoculars are marked with code “fvs” with “Dienstglas” 6 x 30 with ser. Number with H/6400. The frame is covered with black grained synthetic material, the metal fitting show only light field wear and come with the black leather neck strap, nice but could use some oil, in sound condition. The German has carved his name and number on the metal lenses covers. 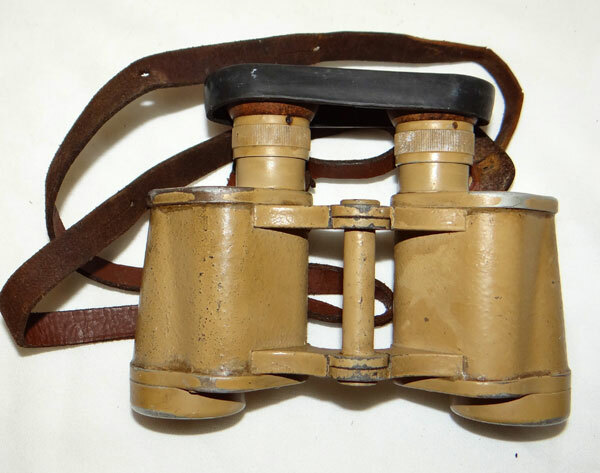 Overall the binoculars show light wartime field wear and age. Case is made of black Bakelite and is marked with “frn” code with 42 date and has the two leather belt loops on the back with two “D” rings one each side for leather shoulder strap, case also looks like it had owners name on it at one time on front side, little hard to see but there. Overall set is nice.